Imagine life is a game where you are juggling five balls. Work is a rubber ball. If you drop it, it will bounce back. The other four balls — family, health, friends, integrity — are made of glass. 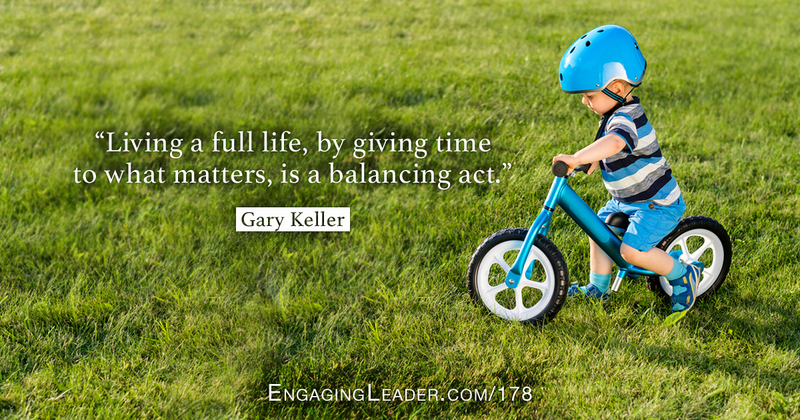 The second secret of work/life balance is recognizing there are two types of balancing: the balancing between work and personal life and the balancing within each. Think about two balancing buckets. Separate your work life and personal life into two distinct buckets — not to compartmentalize them, just for counterbalancing. Your work life is divided into two distinct areas — what matters most and everything else. You will have to take what matters to the extremes and be okay with what happens to the rest. Professional success requires it. Your personal life has multiple areas, and each requires a minimum of attention. Drop any one and you will feel the effects. This requires constant awareness. An extraordinary life is a counterbalancing act. Let the right things take precedence when they should. Get to the rest when you can. In this episode, Jesse shares what he’s learned from chapter 8 of the book The ONE Thing and provides examples of applying the lessons.